Man, my vacation was rough. So rough, I think I want to go on vacation every day. After a 17 hour car drive, we got there and went straight to bed. But then, I got to sleep in, which was heaven sent since I had only gotten 2 hours of sleep the night before, and had been up for 20 hours. That wasn't so fun. But I woke up, and then we went to Olive Garden. My niece got to choose since we were there for her birthday. Olive Garden for brunch (lunch for everyone but my brother and me since he and I slept in so late). 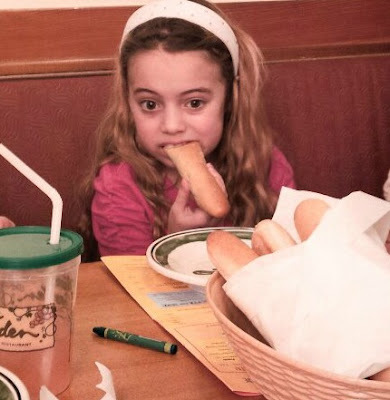 Olive Garden because she loves the breadsticks. She was so tired, it looked like she was half asleep while eating them, but she didn't stop, and it made me happy I wasn't the only one devouring them. I could blame our constant shortage on her, not me. Then, oh boy then things got really tough. We dropped the boys off, and then the four girls (my mom, my sister in law, my niece and myself) all went to get mani-pedis. It was my first time. This trip was full of firsts, I tell you what! They guy who did mine was way cool. I guess he doesn't really talk much, but he talked with me. I learned all about nail care. I learned that my nails show that arthritis runs in my family, and he told me how to prevent it a little. He also told me how to keep from getting hang nails, why my nails split and peel, and how to prevent that as well. He taught me about cuticle health, and why some people get dips in their nails. It was all really great. I love having an educational visit. We got our nails done for my niece's birthday, and I think it is a brilliant idea. I want to take Faye to get a mani-pedi for her birthday. Painting her nails is her favorite thing anyway, this would just make it all the cooler. It would make her feel like an absolute princess. When we were through there, my brother, nephew and I walked over to the Goodwill store. Did you know it is an actual store? This whole time, I thought Goodwill was just a generic name for thrift store. I had never seen an actual Goodwill store before. I guess there isn't much need for them in Utah since we have the DI in nearly every city. I loved the store, and have been searching for a certain kind of pants for a while. I had gone to three thrift stores in Utah, nearly all the stores in my local mall, and of course, Target. No such luck. Here, though, I found 3 pair! Love the Goodwill. When we got back, we had dinner, and then it was just games for the rest of the night. Rough, right? Evidently it was rough for some, though. I talked briefly to the kids while we were at brunch and Faye told me all about how Jeffrey doesn't know how to rub right. She is a funny girl. She loves to be stroked and lightly tickled on her neck and arms and stomach, and back... okay, everywhere. She becomes a big puddle of cuddles and melted preschooler when I rub her. It helps her calm down when she is upset or hurt or scared. Evidently her love language is touch. While I was talking to her, she was excitedly talking about something or other, I couldn't really hear her well in the crowded restaurant, but I did catch "... and Daddy doesn't rub me right." It made me laugh. I asked him about it, and he sighed. For no apparent reason, she started to cry earlier that morning. He couldn't get her to stop, and she was inconsolable. Finally he picked her up and she became super clingy. I felt bad. We both knew it would be hard on her if I left without her. I sort of wish I could have brought her with me, but a 16 hour car drive would have been murder for her! And everyone else in the back seat. Little car seats are not comfortable to ride next to. That night I watched The Avengers with my brothers while drinking rhubarb soda. It was nice because I had been wanting to see it for a while, but even better than that, spending time with my brothers was a real treat. And you can't beat rhubarb soda. So incredibly good and surprising. Not sweet, and it had such a great rhubarb taste to it. The next day, Saturday, was the real reason we had come. It was my niece Samantha's baptism. And her birthday. We all got up nice and early, got ready, and were so happy to share in her special day with her. The spirit was so strong there, and it made me really happy to be able to share that special day with her. She is beautiful, inside and out, and I am so proud of her. The rest of the day was spent relaxing and spending time together, and preparing for our monstrous drive home the next day. You know, grocery shopping, packing, etc. Because we were going to leave at 4:00 am. Can't wait until I get to go on another! Sounds like an awesome trip! What a great time with family and so soooo special you got to be there for your neice's baptism. Oh such a rough trip! ;) I have had two mani-pedi's in my life and never learned a thing while at them, sounds like you had an awesome guy. And yes- some things mom just really is best for and knows best. I love Goodwill. I learned about in Kansas, no less, when I went home with one of my friends from med school. They have much better deals there than DI!! Glad you had such a good vacation. Vacations are rough= I couldn't agree with you more! They are supposed to be relaxing right? But no, every time I come and visit my family and in-laws I end up so stressed and sleep deprived! I just think in the end- was it all worth it? Because I don't want to do that vacation ever again! Maybe I'll do a cruise next time.